What’s up (and what’s coming) this season…. BARBARA COOK’S BROADWAY (Lincoln Center Theater at the Mitzi E. Newhouse, 65th and Broadway). The beloved Broadway veteran holds forth in an evening of theatre songs and stories. Most of the repertoire is new to Cook, and there’s an intriguing disjunction between the sunny soprano who talks to us with unfailing optimism, and the music that now suits her best: ballads burnished with experience and regret, including “In Buddy’s Eyes,” “The Gentleman Is A Dope,” and a heart-stopping “This Nearly Was Mine.” It’s a kind of artistry unimaginable from Cook in her ingénue days, which brings the inevitable reference to passing decades: in October, she will be 77 years old! But the beautiful, rangy voice is astonishingly untouched by time, the technique still more so. I have no doubt that Cook ranks among the master singers of our time, but let’s not yet place her in the past, when happily she’s part of our present. She is scheduled to return to the Newhouse for two weeks in July… and, one hopes, regularly thereafter. It’s a small theatre and Cook has a devoted following, so book early! 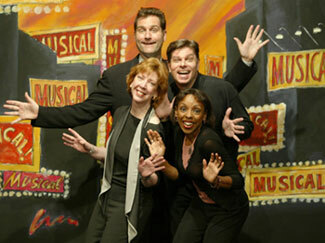 THE MUSICAL OF MUSICALS: THE MUSICAL (York Theatre, Lexington at 54th Street). This off-Broadway charmer takes an archetypal story – maiden who can’t pay the rent vs. villainous landlord – and sets it as five mini-musicals, each sending up a different theatrical model: Rodgers and Hammerstein, Sondheim, Jerry Herman, Andrew Lloyd Webber, and Kander and Ebb. Every parody not only sends up the appropriate style (aged contralto hooting out a Life Affirming Message in R&H, black-clad dancers dragging chairs in Kander and Ebb) but offers superlative puns (lecherous Sondheim landlord makes “specific overtures”) that cite related works. The four performers (two of whom also wrote MUSICALS) are immensely winning individually and collectively, and the bare-bones-ness of the production only makes it all funnier. So much of MUSICAL is referential that I’m not sure it will hold much allure to the non-fan… but aficionados will knock themselves out trying to identify every clue, and might well want to see the show more than once. ASSASSINS (Roundabout Theatre Company at Studio 54). “Brave” and “provocative” are some recurring epithets in the many critical raves for ASSASSINS, Stephen Sondheim’s 1990 show now playing for the first time on Broadway. I’m afraid I can’t share the enthusiasm. It is an audacious idea, this musical about people who killed or attempted to kill American Presidents. But John Weidman’s libretto has nothing to offer beyond pop-psychology platitudes, and Sondheim’s vaudeville-style parade of songs falls far below his best work. Director Joe Mantello compounds the problem by treating the individual assassins as lunatics: the talented performers look like bug-eyed refugees from MARAT/SADE, which keeps us even more distanced from their inner lives. There’s some visual flare to the production, but it doesn’t make the show seem truly substantial. ASSASSINS’ fatal flaw is not that it shocks us, but rather that (amazingly, given the subject matter) it doesn’t. BOMBAY DREAMS (Broadway Theatre, Broadway at 50th). In its London incarnation, Andrew Lloyd Webber produced and championed this show, by hot young composer A. R. Rahman… but Webber dropped it before New York, choosing instead to concentrate on his own music. Good move. BOMBAY DREAMS puts Bollywood conventions on stage, but to no apparent purpose. The rags-to-riches-to-social-conscience story (boy from the ghetto becomes a big star, forgets his own people, then finally rescues them) is laughably trite, and the performers are mediocre. There’s some snazzy, Technicolor design, and a certain retro zest to the vulgar production numbers, which look like a Donna Summer video. But the score is quite ghastly, including a “hit” ­– “Shakalaka Baby” – that I promise you’ll leave the theatre singing… but in an “It’s a Small World,” not good sort of way. THE FROGS (Lincoln Center Theater at the Vivian Beaumont, 65th). New York’s on-going love affair with Stephen Sondheim continues as Lincoln Center produces, for the first time on Broadway, his most arcane piece: an adaptation of Aristophanes’ comedy. When the musical debuted in 1974, it was performed in a Yale swimming pool, with a cast that included then-student Meryl Streep. This time, no pool, no Streep… but as compensation, we have Nathan Lane, Broadway’s human juggernaut, typecast as Dionysus. Want more? Also in the ensemble is SNL’s Chris Kattan… and Susan (THE PRODUCERS) Stroman is directing. No doubt THE FROGS will be the prized ticket of the summer (the run is limited to early October).